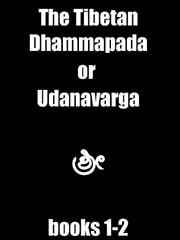 The Udanavarga is a Sanskrit Buddhist text which is similar to the Dhammapada, containing many of the same verses. The Tibetan Buddhist canon contains two recensions of it, which are traditionally said to have been compiled by Dharmatrata. The Udanavarga has around nine hundred and fifty verses in thirty-three chapters, whereas the most common version of the Dhammapada, the Pali, has only four hundred and twenty-three verses.